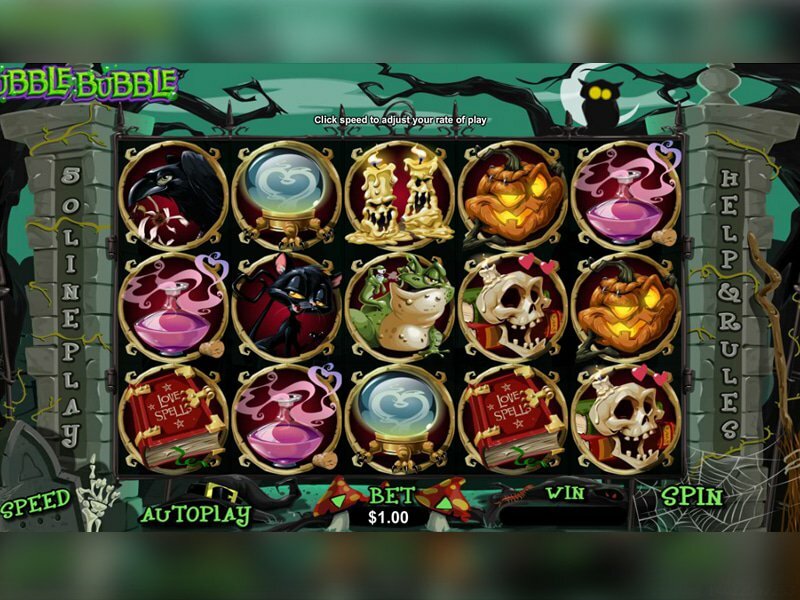 Bubble Bubble online slot is a Halloween-themed game released by Real Time Gaming in 2015. If you are looking for some trick or treat adventures, read this review to find out why trying out this new game is well worth the time. Bubble Bubble is a 5-reel slot with 50 paylines. It is available in iOS and Android devices. Several bonus features like Wild Witch, A Great Ghost, Bewitched, and Scattered Cauldrons make the scary hunt extra exciting. Lots of prizes also await as players search for spooky stuff like spiders and skulls, Jack O' Lanterns, spellbooks, black cats, horrible ingredients, ravens and frogs, among others. The main character in Bubble Bubble online slot is Winnie, a witch, which is also an expanding wild symbol. She leaves loads of things for players to find, all carrying rewarding prizes. For instance, getting the skulls and spiders means winning as many as 99 coins, while finding horrifying ingredients like toads' eyes pays 150 coins. Frogs, Jack O' Lanterns and spellbooks amount to 333 points, and the highest paying is finding the raven and the black cat, which is equivalent to 1,000 coins. The bonus features mentioned above offer rewarding opportunities as well. Finding 5 of the Scattered Cauldrons lets players win 33 times the bet amount. Having one of the 5 cauldrons replaced by the wild symbol Winnie will raise the winnings to 99 times. Getting just 3 cauldrons is not bad, either, as it triggers one of the remaining bonus features - Bewitched, Great Ghost or Wild Witches. The Great Ghost gives 20 free spins and up to 9 wild symbols (Ghost wild) that could help you complete any winning combination. Wild Witches gives 9 free spins plus a chance to win additional big prizes because each time Winnie appears on a reel, she would stretch to 2 additional reels giving a total of 3 wild reels. Bewitched has 7 free spins with a sticky wild symbol on reel 3. Although players are required to play all 50 paylines, betting is still affordable since it can be as low as 0.5 coin per spin. Bubble Bubble online slot is for high rollers, too, since betting gets to as much as 12.5 coins per spin.